This afternoon Benjamin and I dressed Zoë up in her blessing gown and headed outside to take some pictures because, though we took a million pictures of everyone and everything else, we neglected to get any of just her on her blessing day. She's such a beautiful baby. Don't be fooled; she's not sleeping. She's just closing her eyes and, with a slightly haughty turned-up nose, seeming to wish for everyone to go away. It's how she deals with overstimulation Benjamin. She perked up a bit when he started a "collecting firewood" game that did not involve her at all (lucky baby), so I took approximately one million more pictures of her. Zoë's incredibly gifted when it comes to staring into space, but she gets a little more personable and flirtatious every day. She smirks a lot and smiles occasionally. I made her do some tummy time and she didn't entirely hate it, probably because we were outside. She loves being outside. Outside is so interesting. She's pretty much the most beautiful baby in the world. I mentioned on the post about Zoë's blessing day that she wore the dress that both her sisters wore for their blessing days and that I wore for my blessing day, and that Auntie Josie wore for her blessing day. It's gone through thirty years of babies! 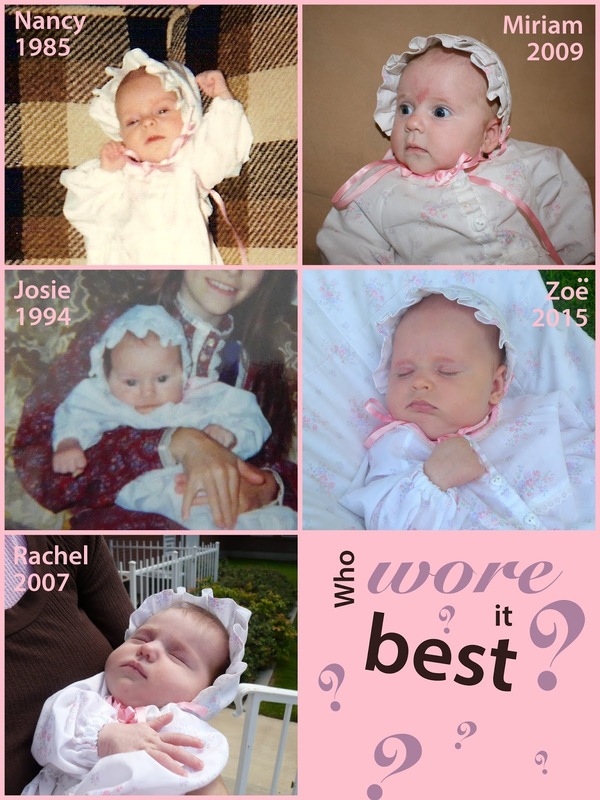 I made a little collage of me and each of my baby girls wearing the dress and asked on Facebook, "Who wore it best?" Unfortunately for her we had no photographic evidence of that. I knew that I had a picture of her in the blessing gown somewhere but where that somewhere was was a complete mystery. This afternoon, however, I had a flash of inspiration and dug through the closet in Benjamin's room and unearthed a scrapbook page I made at a scrapbooking party at Abra's house in the year 2000 (I thought I made it at mutual but I was wrong because that was a different page (one featuring Patrick)). I'm pretty sure those are the only two scrapbook pages I ever made in my entire life. I'm just not much of a scrapbooker. I even remember writing a big journal entry about Josie and my memories of her on the scrapbook page and being told that I was doing it "wrong." And I was like, "If I can't write about stuff then what's the point of having the pictures?" Clearly I enjoy taking pictures of events (and non-events) but equally clearly I enjoy writing about things as well. So scrapbooking really isn't my thing. But blogging kind of is. Obviously. At last our blessing gown quintette is complete! 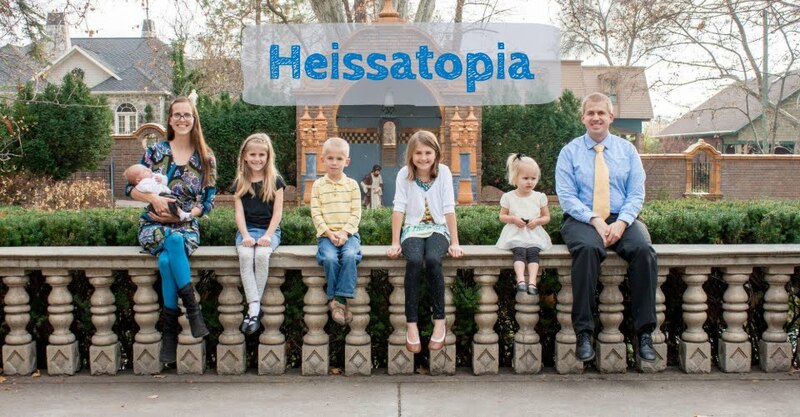 We've been trying to discern who looks the most like whom but it's proving difficult. Maybe we all just look like each other and not like each other at the same time. 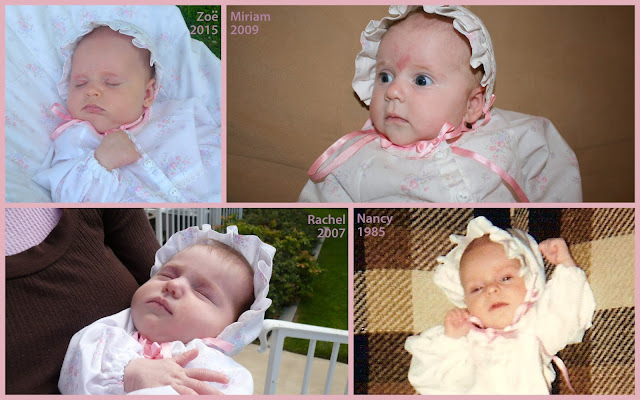 I found three photos of Josie in the blessing gown. 1. Abra holding her. 2. David holding her. 3. Patrick holding her. None by herself, none of you holding her.